How close together can wren houses be? I have two. One looks like an old barn and the other looks like a fishing cabin with dock. They are approx. 30 ft apart on the front of our three car garage. The male bird put sticks in both but don't think we had any little ones. I hear their song and see him at the top of an old dead willow that stands by the creek that runs through our property. Do you think that is where they built the nest? Anyways, I love birds and feed all year long. I had a bunch of young Cardinals and little sparrows this year. Those were the only ones I could tell were young cause the mama and poppa birds would still feed them. I'm glad I found your site, although I live in Topeka, KS. The best way to attract house wrens and chickadees to your houses is to place the boxes very close to a bush or small tree. Wrens look for the shade and protection at the edge of woodlots where thick bushes provide nesting materials and food. Five feet from the ground is the average height to hang the house. There is no exact distance apart they need to be placed. In general, a suburban back yard or garden is large enough for one or two families of wrens. The size of the territory for the male wren is about a half acre area and two to three houses within that territory is acceptable. 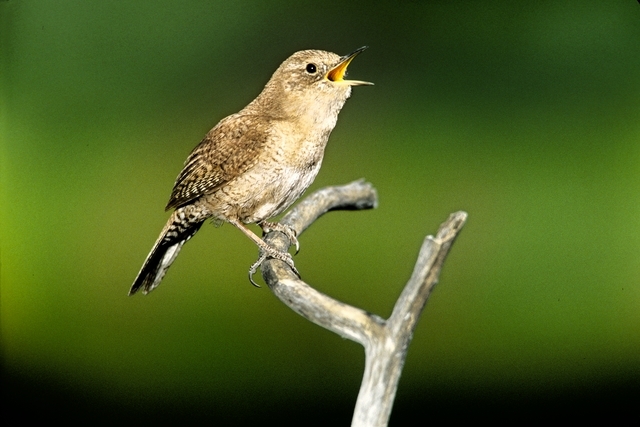 The House Wren’s bubbly song and habit for eating masses of bugs make it a very popular bird to many people. And House Wrens like people just as well. The “house” in their name was given to them for their preference for nesting near peoples’ houses. 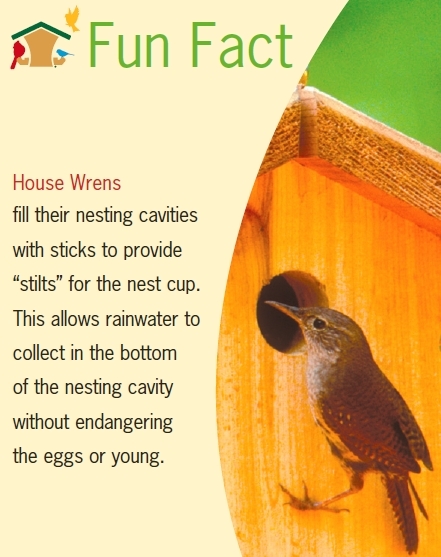 House Wrens are famous for taking advantage of unusual nesting places. Nests have been found in mailboxes, flowerpots, boots, house lights, and of course old woodpecker holes, natural crevices, small birdhouses and gourds. The male House Wren begins to lay claim to a few nesting cavities in the spring by filling them with more than 400 small twigs. When the female arrives, she inspects all the nesting areas and twig structures the male has worked on so hard. She chooses which site she likes best and takes over, adding the nest cup and lining it with grass, inner bark, hair, and feathers. Wrens will usually lay 2 broods in the nesting season from May to July. Because the male Wren builds several starter nests for the female to choose from, the other nests may then be used by the male to raise a second brood with another female or remain in place to discourage other male wrens from nesting in the same territory. So keep an eye out. Just because the female didn’t choose your nest this time, it doesn’t mean it won’t be chosen later. Thank you for sharing your joy of birding. I was watching my first baby cardinals last night too. Poppa cardinal was shooing all the other birds away from the feeders to give his baby a clear pathway. Unfortunately, the baby wasn’t paying any attention and was leading his parents on a merry chase around the yard. 2. Animal Diversity Web. -Dewey, T. and J. Brown. 2001. "Troglodytes aedon" http://animaldiversity.ummz.umich.edu/site/accounts/information/Troglodytes_aedon.html.